Performers include: Jasmine Guy, Kadeem Hardison, Darryl M. Bell, Charnele Brown, Dawnn Lewis, Cree Summer, Lou Myers, Glynn Turman, Sinbad, Jada Pinkett Smith, Cory Tyler, Ajai Sanders, Lisa Bonet, Patrick Malone, Marisa Tomei, Bumper Robinson, Michael Ralph, Mary Alice, Karen Malina White, Bee-Be Smith, Rueben Grundy, Gary Dourdan, Marie-Alise Recasner, Andrew Lowery, and Kim Wayans. A spin-off of the popular Cosby Show sitcom, the series follows Denise Huxtable (Lisa Bonet) as she begins her life as a college sophomore at the fictional Hillman College. Denise’s roommates in Gilbert Hall are naive chatterbox Maggie Lauten (Marisa Tomei) and Jaleesa Vinson (Dawnn Lewis), a 26-year-old freshman who’s already been married and divorced. Other characters include dorm director Stevie Rallen (Loretta Devine), Coach Walter Oakes (Sinbad), wealthy Southern belle Whitley Gilbert (Jasmine Guy), dorky math major Dwayne Wayne (Kadeem Hardison), and ladies man Ron Johnson, Jr. (Darryl M. Bell). Denise left the school after a year (Bonet was pregnant) so the show began focusing on topical issues and following Dwayne and Whitley. 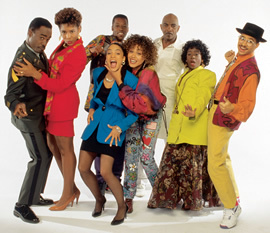 Later characters include new dorm director Leticia “Lettie” Bostic (Mary Alice); law student Winifred “Freddie” Brooks (Cree Summer); Whitley’s roommate, Kimberly Reese (Charnele Brown); mathematics Professor Bradford Taylor (Glynn Turman); Martinique immigrant Gina Deveaux (Ajai Sanders); owner of The Pit restaurant, Vernon Gaines (Lou Myers); students and part-time Pit employees Lena James (Jada Pinkett) and Charmaine Brown (Karen Malina White). This could have been a great show. It simply jumped the shark (I hope I can use that term on this site) when Denise left. I have spoken. I loved this show when it first came out and I still watch reruns on tv One and still love it. I agree with everyone here they should bring this show back or atleast do a reunion show. If 90210 can make a comeback, then A Different World can do the same. Just do a modern version. Going to college will never go out of style. This type of show may spark interest in the generation of today. We need more shows like this. Our kids watch too many videos, and play too many video games. We need quality TV shows, that we can watch as a family.